2013 was a season that witnessed some of the best fishing and weather we have seen in over a decade that left our guests and guides feeling spoiled. 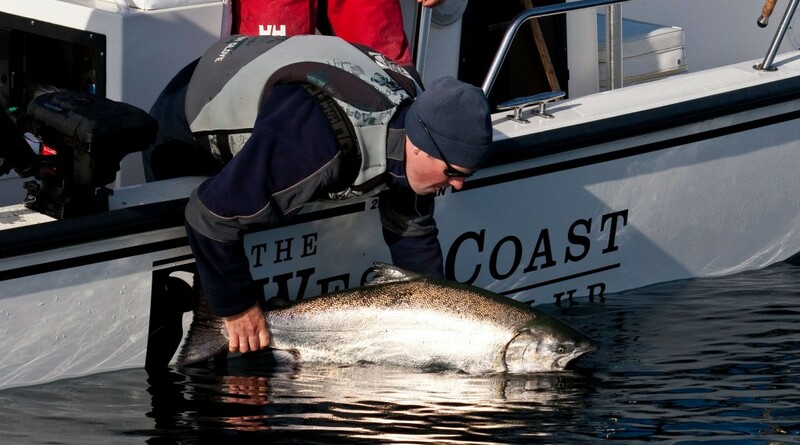 With the 2014 season just around the corner, we are pleased to announce that there are several reasons to be optimistic for another banner summer of fishing ahead in glorious Haida Gwaii. A large number of mature Chinook and Coho are predicted to be coming through this summer, which means an even better chance at that Tyee! The reason for this is that last season a large number of Jack Chinook and Coho, which are immature fish, returned a year early to their natal rivers along the coast. When this happens in large numbers as it did last year, it is a very good sign that a large run of mature fish will come the following year. Chinook and Coho headed for the Columbia River in Washington State travel across our dock each season and it is predicted that there will be a record return of Chinook along with a very strong return of Coho. It has been estimated that 1.6 million Chinook along with almost 1 million Coho will be returning, which is great news for fishing in northern Haida Gwaii. At the end of the day, the beauty of fishing is that when you push off that dock you never know what the ocean will have in store for you. Whether it’s the largest fish you’ve ever caught, the most fish you’ve ever seen, or the biggest fish you’ve ever lost that will haunt your dreams for years. The allure of fishing for many is the unexpected that always keeps you coming back for more. One thing we can guarantee you is that the early season predictions have never looked this good and are setting this summer up to be one of the best ever in northern Haida Gwaii. If you regretted not booking your trip last year and were jealous all season long following our reports, we have some good news for you. We still have space on select trips available so pick up the phone and call us today at 1-888-432-6666 or click here to make a reservation online to secure your spots today!